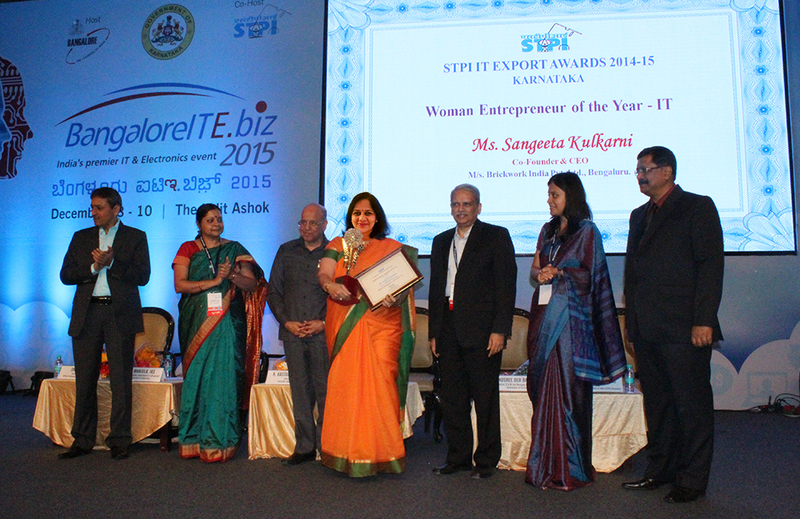 Ms. Sangeeta Kulkarni, Co-founder & CEO has been awarded the STPI IT Export award, “Woman Entrepreneur of the Year – IT” for 2014-2015. Under Ms. Kulkarni’s leadership, Brickwork has experienced all-round business growth and has become the world’s largest provider of remote executive assistance services. With strong focus on business excellence, she has driven revenue growth over 500% which is an achievement in itself for a business that is highly complex, diverse and demanding. She has built a global brand catering to diverse service requirements of clients located across 116 countries by implementing innovative business & people practices and strongly leveraging processes and technologies. Brickwork India pioneered the concept of Remote Executive AssistanceTM in 2005. The idea was to make the benefits of outsourcing available to individuals and small to mid-sized companies, by providing simple to complex business assistance, at an affordable price. This concept found instant worldwide recognition and media attention, including the New York Times best seller 'The World is Flat' by Thomas Friedman and "The Four Hour Work Week" by Timothy Ferris. Brickwork believes in collaborative work and partners with clients to ensure the successful execution of every project. Its clientele ranges from Fortune 500-companies to start-ups and entrepreneurs, spread across the world and across industries. There are three different service lines to address the wide range of business demands at different levels of assistance and capabilities- Knowledge Services, Technical Services and Admin Services.